Float in a pool over the sea and lose yourself to the breathtaking view. Situated atop the cliff of the typical village of Ponta do Sol, in the South of the island of Madeira, the Estalagem da Ponta do Sol is an oasis, fruit of the harmony between nature and intelligent architecture. The origin of the Estalagem lies in the renovation of an ancient manor farm located on that spot, where the integration of a contemporary and distinct concept with the original buildings and the surrounding natural scenery was admiringly achieved. The straight lines in the structures, the simplicity of the decor and the modern design pieces create a relaxing and seductive ambiance certain to cause pleasant surprise. The magnificent views provide a complete immersion into the landscape. At the panoramic restaurant one can enjoy the sea, the village or the banana plantations on the slopes of the hills. From the rooms’ glass windows the ocean seems just a dive away and at the pool the water blends invisibly into the horizon. Enjoy Madeira’s better climate, visit the sunny village of Ponta do Sol, attempt surf and snorkelling at the various beaches and be sure to walk through “veredas” and “levadas”, while taking in the contrasts between the rock lined coast and the luxuriant landscape. - Flowers in the room. - Discount in the SPA. A 25 minute drive from Funchal, in Madeira Island, and forty minutes from the International Airport in “Vila de Ponta do Sol” (town). "Cool Pools - On a cliff; in ecoluxury; under a coconut tree; next to a pyramid: Susan d’Arcy has the best of the blues Estalagem da Ponta do Sol together with Rayavadee, Krabi, Thailand - Mena House, Giza, Egypt and Quilalea, Mozambique." “It is a minimalist hotel without being cold and impersonal, where you can find coziness, luxury and glamour." 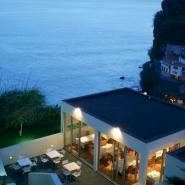 "The picture of Madeira is that of elderly distinct people staying in elderly distinct hotels. Slowly and very smoothly things are change here as well, and so Madeira has a new but still undiscovered hotel, an oasis of relaxation - but, please, this has to be kept between the two of us."